Visit Texas and take home more than just great memories. 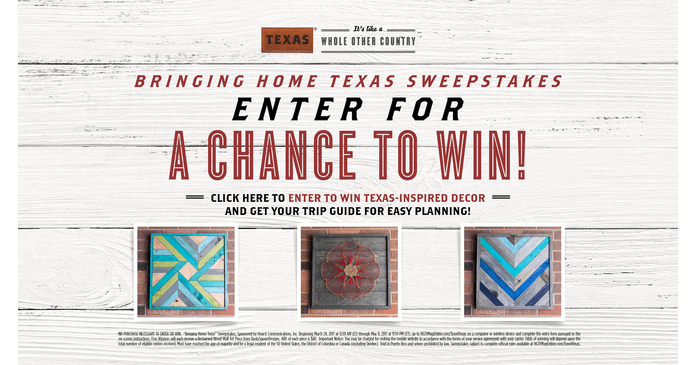 And now, HGTV Magazine invites you to enter the Bringing Home Texas Sweepstakes by visiting hgtvmagonline.com/TravelTexas for a chance to win a reclaimed wood wall art piece handmade in San Antonio by Dusty Square Designs. Prize includes one unique, beautiful designed wall art piece to help you infuse Texas style into your home décor. Go to hgtvmagonline.com/TravelTexas starting on March 28, 2017. Fill in the entry form by providing your full name, complete mailing address, and email address. Click the “Enter Sweepstakes” button to send the completed entry form. Five Winner will each receive one Reclaimed Wood Wall Art Piece from Dusty Square Designs. ARV of each piece is $40. Total ARV of all prizes is $200. The HGTV Bringing Home Texas Sweepstakes is open to legal residents of the 50 United States and the District of Columbia who have reached the age of majority in their state or territory of residence at time of entry. Legal residents of Canada (excluding Quebec) who have reached the aforementioned age in their province of residence at time of entry are also eligible to enter. Void in Puerto Rico and where prohibited by law. Begins on March 28, 2017 at 12:01 AM (ET) and ends on May 8, 2017 at 11:59 PM (ET). Limit one entry per person for Sweepstakes. Winners will be selected on or about May 26, 2017 in a random drawing from among all eligible entries received. For the name of the Winner, send a separate self-addressed, stamped envelope to HGTV Magazine, Floor #23 “Bringing Home Texas” Winners’ List, Hearst Communications, Inc., 300 West 57th Street NY, NY 10019 within 2 months from the Winner notification date. The Sponsor of this Sweepstakes is Hearst Communications, Inc., 300 W. 57th Street, New York, NY 10019.